As much as 150 million rural households across the Global South may be involved in bushmeat hunting, new studies led by the University of Copenhagen find. Hunting is prevalent in the 24 countries surveyed but only providing a small contribution to households and mainly for subsistence rather than for trade. The studies thus contradict earlier assumptions that hunting is increasingly commercial and an essential source of protein and income. The authors stress that rural food security and biodiversity conservation should be considered jointly. Credible scientific evidence has linked persistent decline and local extinction of numerous species across Africa, Asia, and Latin America to hunting for bushmeat and especially commercial hunting supplying urban bushmeat markets. The extent of wildlife depletion is in many locations so severe that it has been referred to as the ‘empty forest syndrome’ and the ‘bushmeat crisis’. Commercial bushmeat hunting is not only seen as a threat to biodiversity but also as compromising the livelihood security of rural households relying on bushmeat as a source of protein and income. “The rapidly growing literature about the role of bushmeat in rural livelihoods is based on relatively few case studies characterised by small samples, limited geographical coverage and methodological pluralism,” associate professor Martin R. Nielsen at the Department for Food and Resource Economics, who led the new studies, points out. He continues: “This constrains the synthesis of findings. Even more problematic, study sites often appear purposefully selected for high levels of hunting and bushmeat trade, which means that available empirical evidence is unlikely to be representative of hunting in most locations”. In an attempt to overcome this bias, Nielsen and his colleagues have used the global Poverty Environment Network (PEN) database that provides a unique opportunity to develop a broader understanding of the economic importance of bushmeat in rural livelihoods. The PEN data was collected in just under 8,000 randomly selected households in 333 communities in 24 tropical and sub-tropical countries across three continents. Most importantly, sites were selected with no consideration of the level of bushmeat hunting. The studies find that 39 percent of the sampled households hunts bushmeat but that this only contributes on average 2 percent of total household income – of which own consumption accounts for 89 percent. Reliance on bushmeat is highest among the poor and inversely related to reliance on domestic animal income. 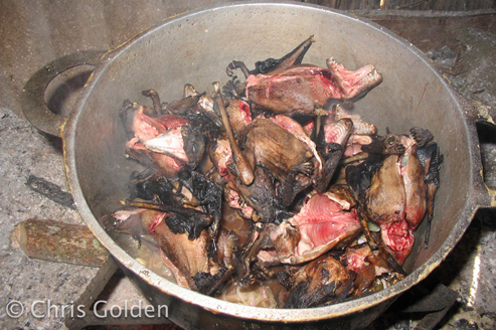 Seasonally, reliance on bushmeat relates inversely to other incomes, suggesting that bushmeat hunting acts as a gap-filler when other incomes are low. On the community level bushmeat is more important in smaller more remote communities in the middle of the cash income distribution, with few domestic animals, and in countries characterised by poor governance and rising costs of living. “The fact that hunting is of low economic importance but widespread and mostly for subsistence suggests that bushmeat is important mainly in rural households' diets”, explains Martin R. Nielsen. “The results lead us to believe that bushmeat is likely to be most important as a source of protein and micronutrients that are unavailable to rural households through their domestic animals and staple crop production,” he elaborates. The studies conclude that household’s food and nutritional security should be taken into account in biodiversity conservation planning rather than those topics being addressed separately. “Our results further imply that these objectives are not necessarily conflicting. On the contrary, the effectiveness of wildlife conservation efforts is likely to be enhanced if rural food and nutritional security is improved,” Martin R. Nielsen concludes. Find the scientific articles here in Biological Conservation and Ecological Economics.